Your recent [Atlantic article] regarding “bus stigma”, along with the concurrent proliferation of various autonomous car posts that I’ve seen all over the web, got me thinking: I am starting to believe that a certain “technophilia” (as you put it so well) not only applies to the “rail-in-any-and-all-situations” proponents, but also to the increasing number of urbanists who have come to view the impending autonomous car future as one in which buses are replaced by Self-Driving Vehicles (SDVs), as they’ve started to regularly call them). Case in point, this blog post [at Grush Hour]. [Grush's] opinions appear to be very similar to those of the various urban planners and urban designers I’ve met and spoken with over the past year or so. Now keep in mind that these folks view themselves as “progressives” on the issue of the need for public transportation. In this case, the author thinks the recent Wall Street Journal Op-Ed which espouses that rapidly developing autonomous car technology means we don’t have to build high speed rail is flawed and incorrect, and that the trip purposes of the modes and their associated distances, et cetera, are sufficiently different to mean that high speed rail will still have a place, even with SDV’s. The frontier benefits of the SDV will accrue during 2022-2042 as special, restricted applications such as replacing mostly-empty and oversized urban buses, expensive and poorly driven taxis and shared cars. Here is where I would like to see Winston’s call for private funding focused: urban fleets of self-driving jitneys to replace every form of motorized shared vehicle (bus, taxi, street car, shared car, vanpool) from the front door of your home or work right up to the light-rail and heavy-rail transit station and vice versa. Replace them all. Then by 2045, maybe the US Congress will be able to pass another Surface Transportation Reauthorization Bill in plenty of time to eulogize the last of the personally-operated SOVs and fix the last of the traffic signals in time to remove them all, because they will no longer be needed. I don’t honestly know what to make of this …; it seems that people have such a “stigma” against buses that they view SDV’s as being able to replace them completely and instead we would then have an on-demand or subscription-based autonomous jitney/“Johnny Cab” system which takes you (of course) to the rail line – if it doesn’t provide for your whole trip. To be clear, this author is not the only one I’ve read or person I’ve spoken with who believes this – rather, this rationale is what I am increasingly seeing being espoused everywhere I look. So, as far as I can tell from reading these materials over the past couple of years, it would appear that the most “anti-urban” (and perhaps least progressive) sort of folks see SDV’s as replacing the need for any public transit whatsoever – including the rail modes right up to true High Speed Rail – while the most progressive and pro-urban folks see SDV’s as at least replacing almost any and all buses (but not necessarily rail), and that “traditional, fixed route transit will only be needed in the densest cores of our cities”. 1. Is this another form of “bus stigma”? Or rather are buses simply most suited to an urban transit speed/capacity niche whose days are numbered, so to speak, as being the domain of the bus? I find it interesting that most urbanists (but not all – there are actually a few out there who think a robust and subsidized SDV system can even replace rail and other fixed guideway high speed/capacity modes) seem to salivate at the thought of getting rid of the “lowly” bus, but that SDV’s can’t, won’t or shouldn’t replace rail. Or they at least say that bus service will be relegated to the densest corridors where (eventually) it would be replaced by a rail line in any event. 2. The follow-on question I have for you is this: is there a future – in a world where SDV’s have been fully developed – for the “regular” transit bus service that operates along a corridor where service is only provided every 15 minutes, or every 30 minutes, or even every 60 minutes on weekends (i.e., the vast majority of North American public transit service)? Or will SDV’s eliminate the need for such bus service? The argument I was told this weekend by a city planner while discussing your “bus stigma” posts and the latest “Google-car” advances goes something like this: a very significant portion of riders today – of whatever income group – use buses just because they don’t have to drive or look for parking, and the fare is reasonable. If an SDV service can take you door-to-door, without you needing to drive, park or fuel it yourself, for a fare similar to the bus, and for a total trip time at least as fast as the bus (yet likely shorter) but just slightly longer than a purely private car, then in the vast majority of North America where densities are not all that high “the big ole’ regular bus running every 10 to 15 minutes is history, along with the horse-drawn omnibus, and transit agencies will find themselves in the same territory as buggy whip manufacturers…” This lady even quoted you back at me: she pointed out that if “frequency is freedom”, then “think of the immense freedom and mobility the public sector-subsidized SDV can provide, while saving us the costs of big buses and their unions…” Sheesh. So, what’s your take on the future of the regular, non-heavy-corridor bus service that runs every 10 to 15 minutes? 3. Finally, my last question: the Gensler fantasy which you took down so effectively seems to always re-appear in some form or another; does it become more (or even less) viable with the assumption that the vehicles are autonomous? Technology never changes facts of geometry! We can be quite confident that nobody (on this world or any other) is going to discover a technology that changes the value of pi or that suddenly causes large, uncompressable objects to fit into boxes smaller than they are. We know that because we understand the special status of mathematical and geometrical facts. Indeed, they are so much more certain than any other "fact" that we should have a different word for them. If you define a "car" as "a separate enclosed vehicle for every passenger or party", then the geometric fact about all cars, self-driving or not, miniaturized or not, is that they take vastly more space per passenger than effective public transit. This will not be a problem in low-density suburbs, but cities, by definition, are places with relatively little space per person. Self-driving cars will certainly improve the efficiency with which cars use space, so they will shift the calculus somewhat. But the bottom line will still be that if you want two crash-safe metal walls between every two strangers going down the same street, you will need a lot more space than if those two people can sit next to each other on civilized public transit. You will also need vastly more metal and equipment, which means that the self-driving-car-replaces-transit fantasy involves massive industrial production with severe consequences for energy security and greenhouse-gas emissions. As for the idea that somehow these cars will replace buses but not rail, this may be true around the margins. Grush's reference to "replacing mostly-empty and oversized urban buses" is a crude approximation of the issue and misses the point about why these sights occur. The real problem is that most "legacy" labor agreements don't allow transit agencies to pay drivers less to do the easier job of driving a small bus in a low-demand area, and given that it's cheaper (due to high maintenance costs of fleet diversity) to run a standard modular bus everywhere. (Vancouver's TransLink is a spectacular exception.) Most transit agencies run low-ridership service that is a drag on their budget, but that meets social inclusion or equity needs. Most agencies I have worked with would be delighted to see those predictably low-ridership "coverage" services transitioned to a more decentralized or low-cost model, or moved off their books entirely, so that they could focus their big buses in places where they'll be full. They are assuming that technology will change the facts of geometry, in this case the facts of urban space. If they think that self-driving cars will replace buses but not rail, then they haven't informed themselves about the vast diversity of different markets that buses are used to serve. Self-driving cars many logically replace some of these markets but not others. 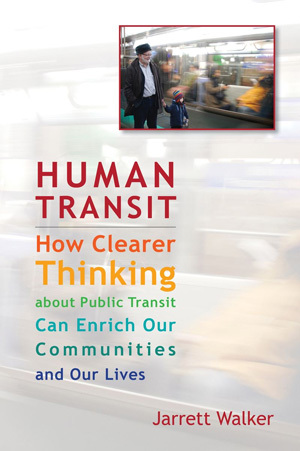 They believe that public transit is incapable of improving in ways that make it more positively attractive to a wider range of people, despite the fact that it is doing so almost continually. Again, the whole bus vs rail confusion here arises from the fact that technophile urbanists classify transit services according to how they look and feel, whereas transit experts care more about the functions they perform. So yes, buses are currently doing some things that other tools could do better, especially in sparser markets. Some agencies, like Vancouver's, already have the tools to solve that problem. But when a huge mass of people wants to go in the same direction at the same time, you need a rail if you have tracks and an exclusive lane for them, or a bus if you don't. I don't care whether it's rail or bus, but the need for a high-capacity vehicle running high quality service that encourages people to use space efficiently — that's a fact of geometry! “shockingly neutral”: my first sort-of negative review! Much of Walker's technical discussions aren't any more riveting than they sound. And yet, it is, on the whole, … a surprisingly un-tedious exercise in armchair planning. Walker loves and believes in public transit, but his awareness of the costs and tradeoffs render him a shockingly neutral advocate (if such a thing is possible). On the one hand, Walker is trying to encourage stakeholders to advocate for better transit systems. But if you read him closely, you might end up with mental gridlock (while actual gridlock grows all the worse). I can accept being nonriveting — this isn't Stephen King — and am happy to settle for "un-tedious." Otherwise, I treat this critique as a badge of honor. To me as a consultant, few epithets are finer than 'shockingly neutral.' Yes, my book is about helping you and your community think about the real choices that you face. And yes, to make those choices, you in your armchair (and your community in the real transit planning process) must think about what you want, and sometimes about which of two things you want is more important. I'm sorry if that gives some people "mental gridlock", but functional human beings and communities do this all the time. Everyone understands the process of budgeting when money is at stake. Transit simply requires the similar kind of hard-tradeoff thinking in some other dimensions, including street-space, service priorities, etc. My book also makes budgeting decisions around transit much easier, because it helps everyone understand exactly what they are buying or sacrificing. Once, years ago, I was working with a community's elected officials to help them reach a consensus on how they want to balance the competing goals of lifeline coverage vs higher ridership. (The former goal produces a little bit of service everywhere and the latter produces a high-intensity network only when demand is high. See Chapter 10.) We were having a contentious public meeting on exactly this subject, with the electeds debating each other and the public inserting a range of useful testimony. The electeds were going to have to vote. We took a break, I went to the men's room, and suddenly one of the electeds was at the adjacent urinal. He whispered: "Hey Jarrett, I know you don't want to say anything out there, but really, what do you think we should do?" As a citizen I'd have an answer based on my values, but I wasn't a citizen here. I was here to help a community make its own decision. So my private answer was the same as a public one. "No! This is not a technical question. You have to balance your priorities between two things that you value, just like you do when you're budgeting. This is a chance to express your values, so asking me to tell you what to do is like asking me to tell you who you are." Obviously, once you've chosen what you want, your consultant will start telling you what's required to deliver that outcome, and in that mode the consultant may sound like an advocate. But that only happens once the client — you, your community, your electeds — have stated their desires clearly in an understanding of the tradeoffs they imply. Sorry. Life's full of hard choices, for people and for their communities. If it gives you mental gridlock, put down the book or step out of the meeting. Breathe fresh air, study a flower, or look at the stars. But sooner or later, you'll decide, or others will do it for you. I’m relieved to report that commenters who actually saw me give the presentation “A Field Guide to Transit Quarrels” seem to agree that I wasn’t displaying a bias toward or against particular projects, except perhaps for projects that were based on misunderstanding or ignoring some basic geometry. From Alon Levy on my post re: New York’s Bus Rapid Transit product, the Select Bus Service (SBS), which references this story in New York Magazine.